I had a little taste of summer in the days following Christmas. It was unseasonably warm for Chicagoland, near 50 degrees on Friday and still above 40 degrees on Saturday, but it was what I did with it that felt like summer. On Friday, I took the kayak off its place on the garage wall. It hadn’t moved in at least two months and had gathered dust. Wearing waders on my bottom, and multiple layers on top, I paddled the length of Wooster Lake and back into two feeder creeks that are weed choked in the summer. The quiet water in the creeks was splendid for paddling. Ducks were hidden back there walking on patches of skim ice. It was a smart way for them to survive hunting season. Using my paddle to test for water depth, I found a few deep holes back in a creek that I’ll want to visit with a fishing rod next spring. I didn’t stay out long. Fifty isn’t warm when you’re sitting atop water that is just above freezing. Saturday, I bundled up again, and fitted my bike helmet over a ski mask type stocking cap. I rode the bicycle about 30 minutes, enough to work up a sweat under the winter coat I was wearing. Managing body temperature during vigorous winter exercise can be quite a challenge for me. While I was sweating my nose was feeling the wind chill from the speed of the bike. April, and warm spring days, are a long way off. I’m going to work on a strategy for managing my body temp during paddling, biking, hiking, and cross country skiing this winter. Getting face, feet and core in sync is the challenge. I know that I should be cool when starting out, so that I’m not over-heated later, but proper judgments about the various parts of me are tricky. If you have any secrets, please share them. This entry was posted in Uncategorized on December 29, 2014 by gstockey. It’s about 35 degrees today; gray with overcast. Looks and feels a lot like November. I just looked out again and it is snowing. But Friday was a glorious day, and a reminder that it really is springtime. Friday afternoon it was 70 degrees. A quick walk beside the neighborhood pond wearing polarized glasses revealed what I hoped it would. Bass were pushing into shallow water. I ran back to grab a rod and some bait. 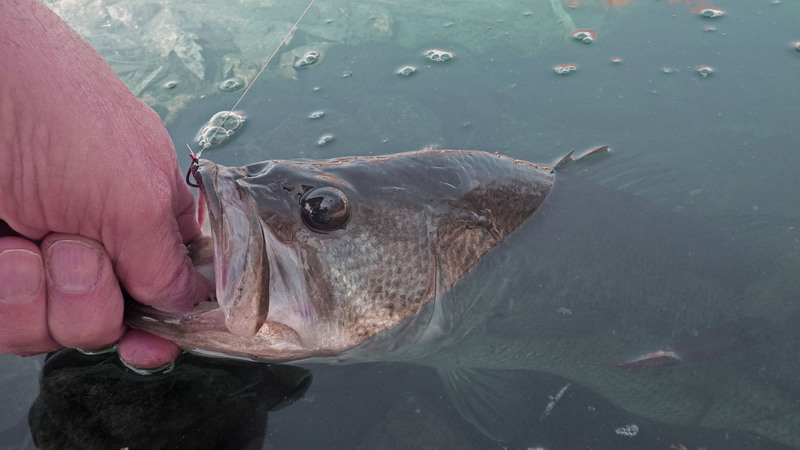 Often the bass ignored the bait, and would turn and slowly head back to deeper water, but there was a flurry of action. I landed 10 bass in about 90 minutes. The sun then went behind a cloud, and the wind picked up. The bite stopped. That evening my wife wondered if the bat would be back. Last summer, a bat would fly back and forth at dusk, just above our deck. “Too early,” I said. But there he was just before dark, flying figure eights over our deck. April 11th 2014: first bass and first bat of the year! This entry was posted in Uncategorized on April 14, 2014 by gstockey. My son is 25 years old. To say we have had challenges getting along is probably an understatement. While Bonnie and I were planning our trip to the Ozarks he was talking about 2 or 3 different options for vacations with friends. The friends bowed out one-by-one, or the trips were unaffordable, so suddenly Matt was without a vacation plan. We asked if he wanted to go with us. The price would be right for him; zero. he readily agreed. When I asked if he wanted to join me on a full day fishing during the trip, I expected he would decline. He hasn’t shown much interest in it. To my surprise he said yes. Bonnie wondered if he would find an excuse to stay home, but he didn’t. When he didn’t appear at the designated hour for departure, I wondered too, but he raced in right away and was packed and ready to leave. Overall, I would give the father-son experience a big thumbs up. 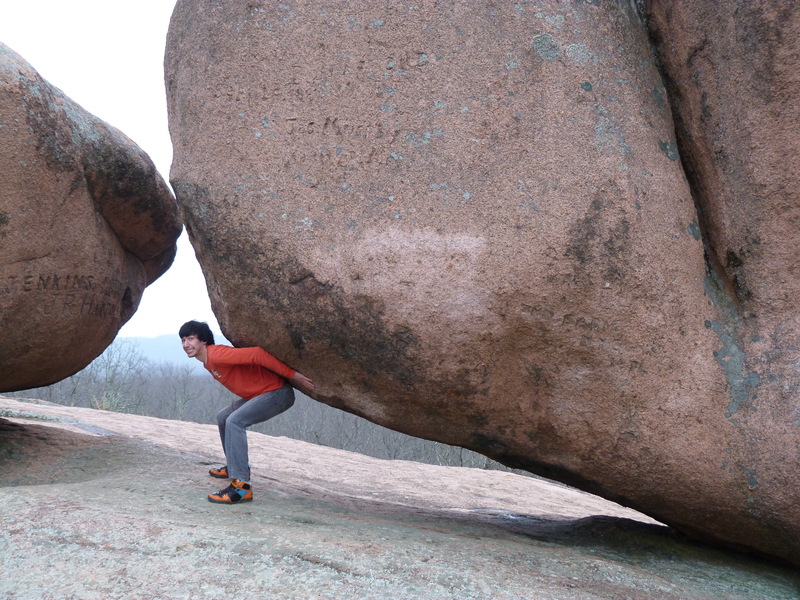 There were a few testy moments, like running wild through Elephant Rocks State P ark. I expected to find him broken at the bottom of a cliff, and no amount of coaxing could slow him down, but we all survived. 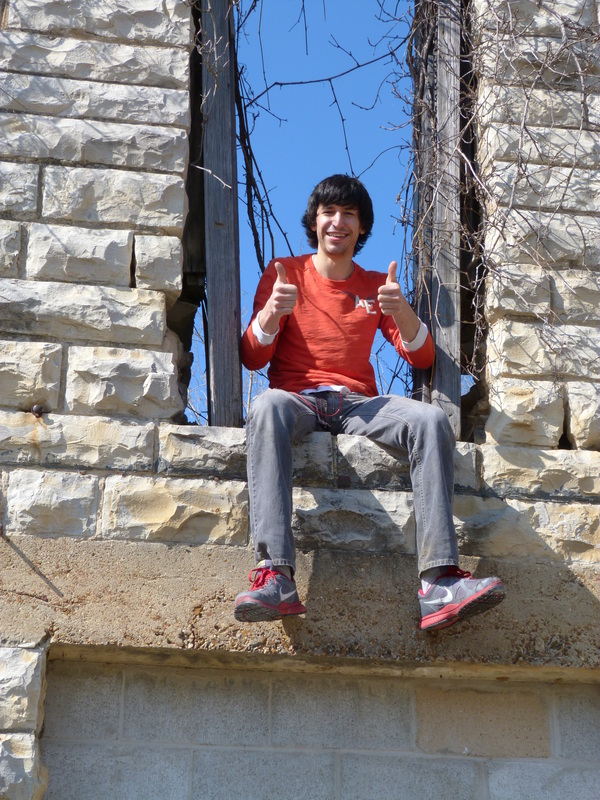 When he insisted on climbing up into the window frame in the ghost town of East Calico, we only needed one Band-Aid to cover the wound. He was attentive throughout our fishing day, caught trout, and had fun. He may have even caught one or two fish more than me, but who’s counting? throughout the week he helped carry luggage, grill meat, and read maps. I don’t know if this will be the last family road trip or not, but it was memorable. I mean that in the good way. This entry was posted in Uncategorized on April 11, 2014 by gstockey. Ozark spring break, 2014 edition, was a great adventure. I plan to post twice about it. This post will focus on the outdoors, the second on interactions with my 25 year old son that went with us. 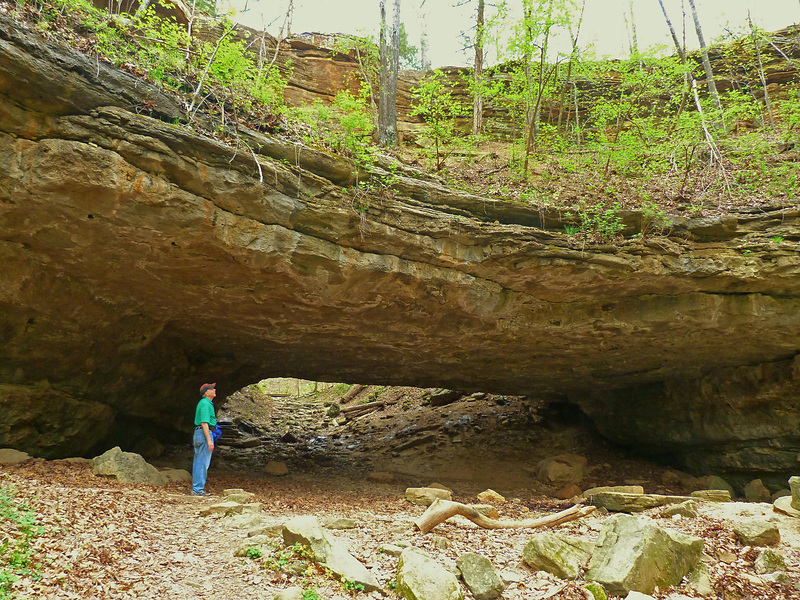 The Ozarks are filled with geologic wonder. Porous rock creates countless caves, springs, cliffs, and other curiosities. While down there, I read about a river that disappears underground and appears again 20 miles away. They know it is the same river because they tested with dye (think Chicago River on St. Patrick’s Day) and found the dye appearing above ground that distance away. We visited several springs, including Mammoth Spring, which produces 9-10 million gallons per hour, creating a floatable river with constant water level and a constant temperature of 58 degrees. 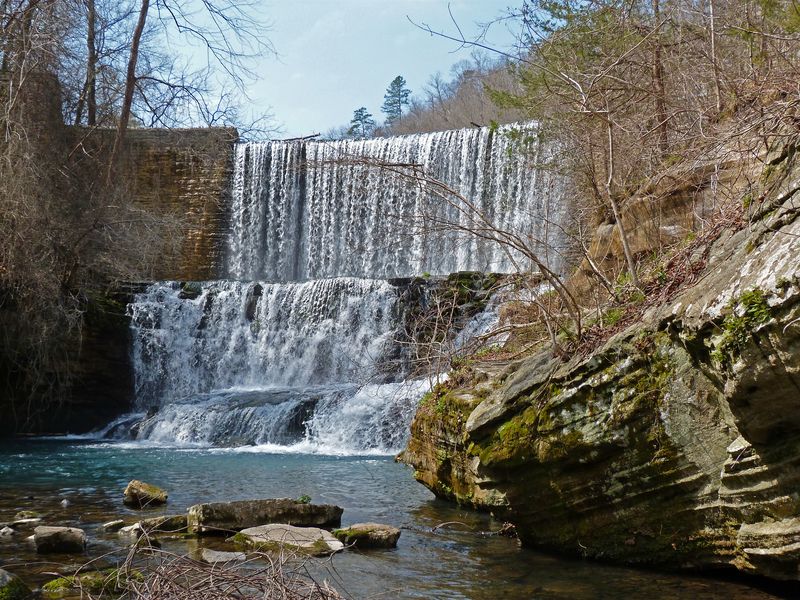 One could easily fill several week-long vacations visiting such sites in southern Missouri and northern Arkansas. Many Ozark rivers have been dammed to harness their power for electricity. On little streams these dams powered personal businesses; such as grinding flour and sawing lumber. 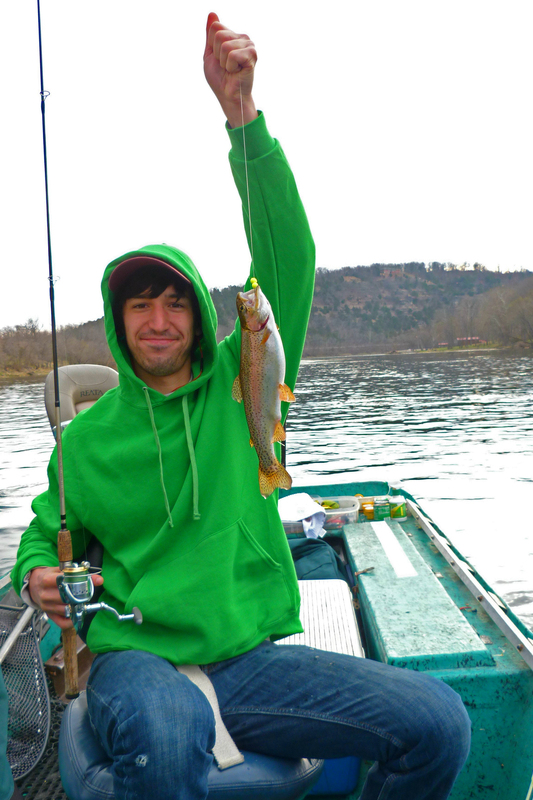 On larger rivers the dams have created renown fishing lakes such as bull Shoals and Table Rock. These larger dams release water from the bottom, creating “tailwater” fisheries. The water released from the bottom is constantly cool, so it creates trout water. The amount of water released varies with demand for electricity, so water levels on the tailwaters can fluctuate, sometimes multiple times in a single day. Perhaps the most famous tailwater river in Arkansas is the White River. We fished it for one day. I came prepared to throw crankbaits for big trout, but was advised to follow the locals.The typical White River technique is to use a bell sinker on a three way rig to drift bait along the bottom. When water is low, the drift is slow and easier to control. In high water the bait drifts faster in powerful current. I didn’t study enough to realize that on a Monday demand for power would be higher than the weekend, and would affect the water level, so we dealt with high and rising water all day. next time I would plan to fish on Sunday, when water is predictably low. With thunderstorms approaching, Matt and I caught 20 trout before lunch, keeping three to eat and releasing the rest. After lunch we landed two more before thunder chased us off the water ahead of schedule. We were satisfied. The next day we toured Blanchard Springs Caverns, an amazing cave on National Forest land. We were not allowed to photograph the gigantic and varied formations because of concern for bats. 250,000 bats were still hibernating in Blanchard Springs Caverns, but not one was spotted in the rooms we were allowed to visit. After my fourth trip to the Ozarks in recent years I haven’t tired of it. I haven’t seen everything I’d like to see there, and I want to catch more trout now that I understand better how to fish that unique water. Check back in a day or two for reflections on traveling with my son. This entry was posted in Uncategorized and tagged Blanchard Springs Caverns, Ozark rivers on April 9, 2014 by gstockey. Spring finally appears to be around the corner. As we wait for it to arrive, I’m going on a road trip to see if I can find it somewhere else. My family and I will be traveling 500+ miles south to the Ozark Mountains. I plan to fish the famous White River while we are in Arkansas. This is a place where brown trout grown to 20 lbs. No little trout baits were recommended. Bring the countdown Rapalas is what I was advised. (For those that don’t know, these are typically used for bass or walleye fishing.) Those that know me will not be surprised to know I have been selecting and organizing gear for weeks already. I wonder what important thing I’ll leave behind despite all the planning. Besides a little fishing; we hope to golf, hike, explore a cave, photograph a waterfall, and listen to live music. Like all our vacations, I’m planning a surgical strike, ferreting every experience possible out of a 6 day road trip. I’ll report back to you when we return. This entry was posted in Uncategorized on March 21, 2014 by gstockey. The Illinois smallmouth Alliance’s annual banquet, The Bronzeback Blowout, was held last Saturday. My streak of not winning any raffle prizes remains intact-I was skunked again-but I enjoyed the party none-the-less. Catching up with old friends and acquaintances was great fun. Pete Plauck, an extraordinary fisherman, was recognized as an original member of the organization on its 20th anniversary. He looks like he was about 14 years old when the ISA was created. Ed Buric was making fishing plans for spring that include me. Thanks Ed. Somebody needs to be thinking ahead. The featured speaker was someone I’ve known for about 15 years, Dan Basore. I know Dan as one of the most persistent collectors of old fishing lures, and one of the most knowledgeable. He has a huge collection that he displays at outdoor shows around the country. 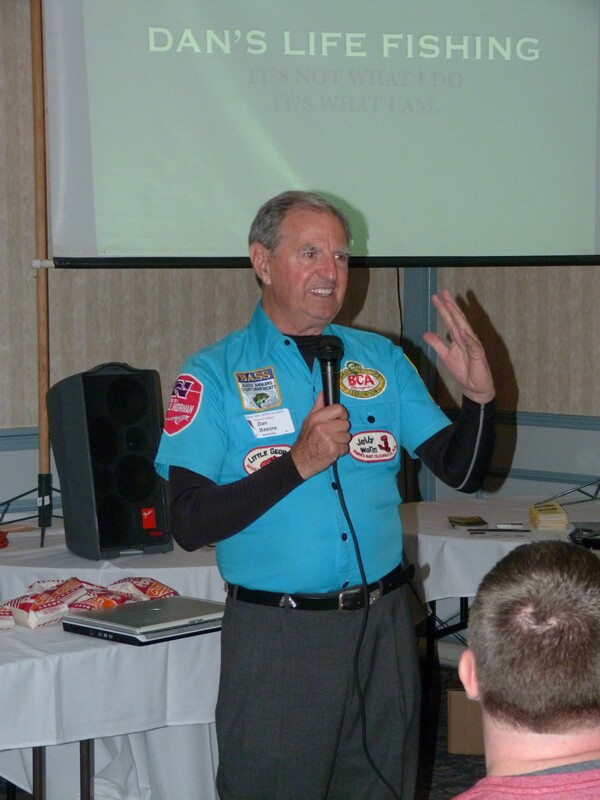 For the National Fishing Lure Collectors Club, or NFLCC, Dan runs the honorary member program. His goal is to recognize lure making innovators and pioneers while they are still around to enjoy the recognition. But, Dan’s program at the Blowout was not about old fishing lures. I learned that he was around at the beginning of the bass fishing tournament trail, hanging out with and competing against all the biggest names in fishing. Dan’s program was called “My Life in Fishing” and concluded with, “Fishing is not just what I do, it is who I am.” The program was interesting; a nice mix of self-disclosure, war stories, and information. As always, the Blowout has me longing for spring, anxious to get out on a lake or river somewhere. It is going to be 50 degrees this week. April can’t be far away, can it? This entry was posted in Uncategorized on March 8, 2014 by gstockey.